Owls are kinda nasty. I’m putting that out there right now. Beautiful, graceful and mysterious, yes, but also kinda nasty. 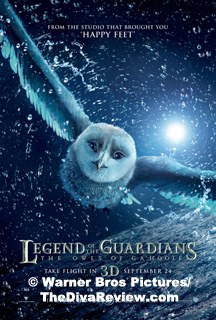 In one of our earliest scenes in Legend of the Guardians: The Owls of Ga’Hoole, a field mouse is minding its own business, taking the night air, when silently out of the clear midnight blue sky, the moonlight flashes off a pair of talons and the mouse has ceased to be. It’s now a meal for a winged predator and his family. Unfortunately, we’ll be seeing the mouse again. 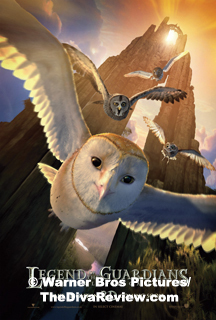 Based on the successful Scholastic series of books by author Kathryn Lasky, Legend of the Guardians gets underway after that sad farewell to the rodent with scenes of domestic tranquility inside an owl’s nest. We meet Soren, his brother Kludd, baby sister Eglantine and their loving parents. 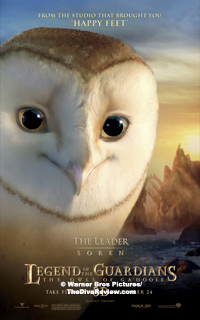 Soren is every feather a dreamer and he regales his little sis with stories of the legendary Guardians who fought the evil Metal Beak and his band of Pure Ones for the freedom of the owl world. His dearest wish is to one day fly to the mythical Great Ga’Hoole Tree and become a Guardian. 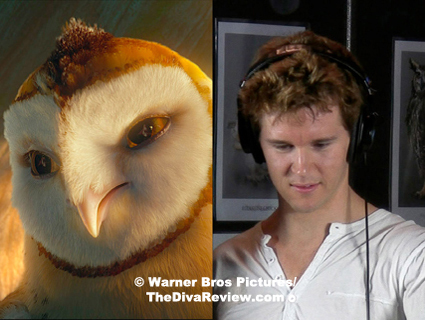 Kludd sneers at his brother’s fancies but envies Soren’s superior skills as their father trains his two young owlets to fly. 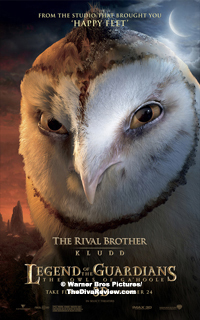 Kludd’s impulsive act of jealousy finds the brothers hurtling out of the safety of their nest and on the ground; the worst place for any owl to be, exposed to predators of every kind -- even their own kind. 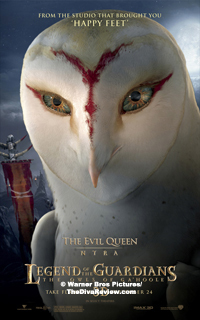 The siblings are saved from the jaws of sure death to face a possibly worse fate as a gang of marauding owls kidnap the pair to serve as slaves under Metal Beak and his queen, Nyra. The evil twosome are collecting a special magnetic metal (- from regurgitated owl pellets!) that when combined will create a weapon that will control all of owlkind. The brave Soren, now joined by the tiny, feisty Gylfie, quickly plots an escape, but finds his brother less than excited at the prospect of leaving. 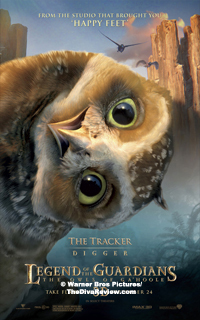 Grimble, a kindly old owl whose family was stolen by Nyra, helps the two new friends find their way out of the terrible slave pit and sets them on the path to find the Guardians so they can put a stop to the rule of Metal Beak and the “Pure Ones” once and for all. 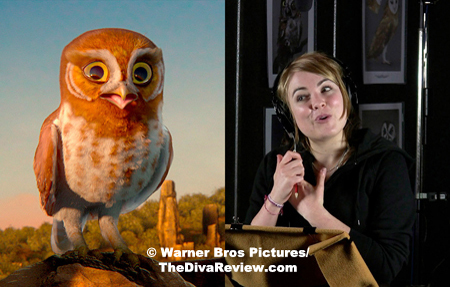 Exciting and exuberant, Legend of the Guardians is a great piece of animation. 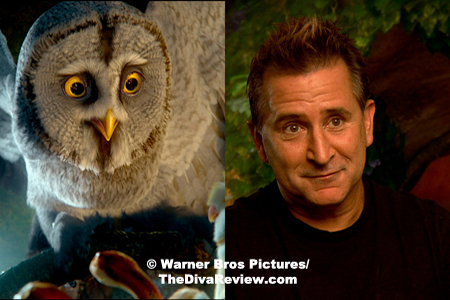 Writers John Orloff and John Collee craft characters we care about and whose personalities shine through the restricted range of emotion the owls’ faces can display. 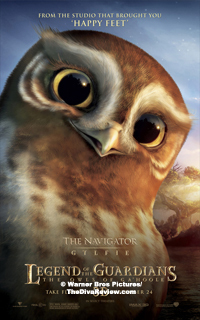 Known as the deadliest hunters in the avian world, we revel in the power and beauty of owl flight and the film’s 3D technology is shown at its best, as the owls swoop through freezing torrential rainstorms and spiral through midair battles. As might be expected of the director of 2007’s action zeitgeist 300, Zack Snyder brings a high level of intensity to the film’s battle scenes, which are often downright scary with the owls going to war in frightening helmets and deadly sharpened metal claws tied to their own talons. I wondered how many children wouldn’t be startled by the realism of the birds’ features, which even in repose can look very forbidding. Snyder’s owls are only sporadically cute as he opts for more realism in their design than sweetness. The whole movie is a dark affair not only because of the nocturnal habits of its main characters but its tone is quite grave despite ultimately being the story of a boy reaching his dream. The lesson of Soren’s completed quest to meet the Guardians he fantasised about for so long is be careful what you wish for. The brutal reality of war isn’t anything at all like Soren’s innocent, happy daydreams back home in his tree. One must wonder if Snyder consciously chose to make the film as intense as it is expecting more out of his younger audience than many other filmmakers might, or is it a miscalculation? 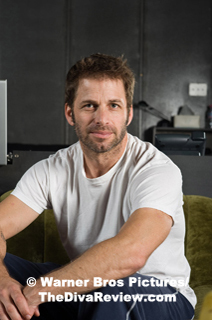 I think it works; I’ve never been one for coddling the kiddies overmuch and Snyder is judicious in showing no bloodshed and not dwelling too long on heavier action, yet he never dumbs down his film and that’s to be admired. 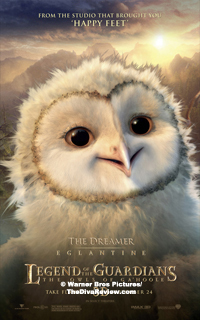 What may not be so admirable are the zillion other literary and cinematic references saturating Legend of the Guardians. I defy anyone to see this film and not walk out with Howard Shore’s Lord of the Rings score in their head. So much of our premise and characters are cribbed from Tolkien one wonders where the royalties go? 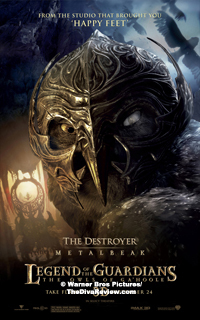 Metal Beak wears what looks like a bird version of Sauron’s iconic mask and hovers on a high cliff overlooking his minions down the mountain working to complete his weapon. His mate, Nyra is an evil feathered fiend version of the beautiful and terrible Galadriel and the snowy white king and queen of the Guardians are very like Elf royalty. 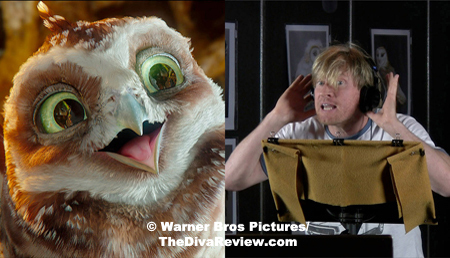 Heck, Elrond himself, Hugo Weaving, plays Soren’s dad and David Wenham, Lord of the Ring’s Faramir, plays our twitchy comic relief, Digger, the burrowing owl. 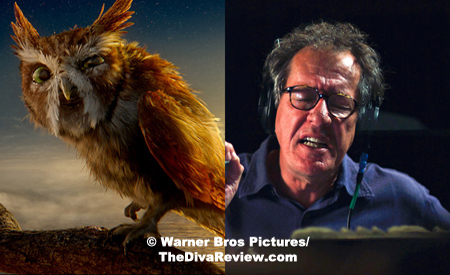 As for other references, Geoffrey Rush’s crusty one-eyed Ezylryb, Soren’s great hero, is a wizened eccentric along the lines of Star Wars’ Yoda and the entire island of the Ga’Hoole tree must be located off the coast of Avatar’s Pandora. It’s even got luminous jellyfish floating through its outsized twisty limbs. Will the kids mind this unsubtle mishmash of pop culture potpourri? Not a lick and neither will their parents and that’s mostly due to the amazing airborne action and to the carefully crafted characters. 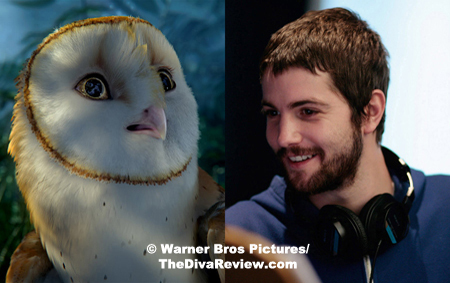 Jim Sturgess plays bright and naïve as our young hero, Soren, who takes the journey from wobbly-winged owlet to battle-ready hero in mere days. 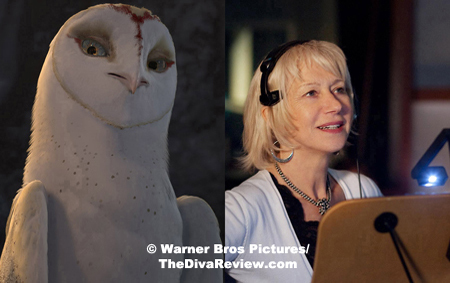 Helen Mirren as the slinky, wicked, sharp-eyed bride of Metal Beak is every inch as terrifying as her spouse. 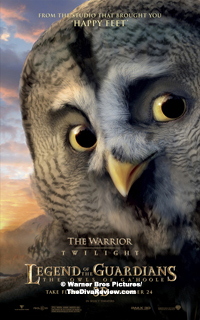 Anthony LaPaglia is a hoot (All pun intended) as Twilight, a warrior owl who would rather spend his days singing his awful poetry very badly to any willing victims and quite a few unwilling ones. All the actors sink perfectly into their animated counterparts, making the audience’s connection with the characters that much more seamless. 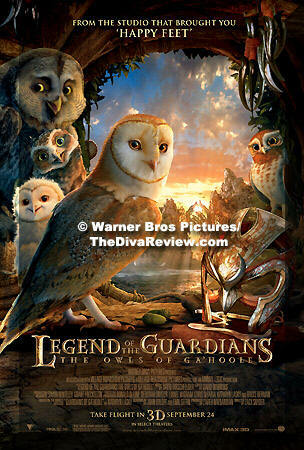 Packed with thrills and excitement for the entire family, Legend of the Guardians: The Owls of Ga’Hoole is one of the most entertaining films of the year. It’s so good, you’ll hardly mind the mouse pellets.